Golden Riviera Casino aims to combine the excitement of Las Vegas with the opulence of the French Riviera to create an elegant and luxurious online casino. The casino is part of the Vegas Partner Lounge gaming group of online casinos. It is licensed by the Lotteries and Gaming Authority of Malta and is approved by eCOGRA for safe and fair gaming. 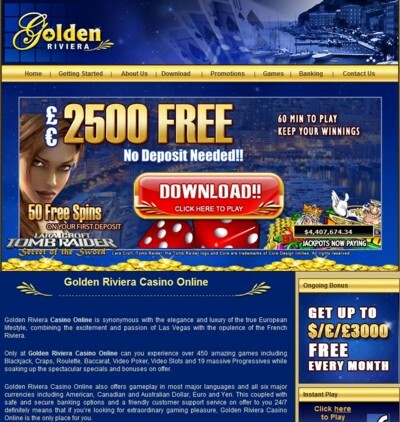 Golden Riviera Casino is powered by the online casino software provider, Microgaming. The software is available in a downloadable version as well as a no download instant flash version. The software supports play in multiple languages, including English, French, German, Spanish, Greek, Dutch, Japanese and Italian. There are more than 600 online casino games for you to choose from including all of your favorite table games, card games, slots, video poker and progressive games. Golden Riviera Casino offers exciting bonuses and promotions to all of its players. New customers are eligible for a generous $/€/£2,500 FreePlay offer, where you can play for 60 minutes with 2,500 worth of free credits. You do not need to make a deposit and you will be given the opportunity to claim your winnings. There is also a Match Bonus offer which you can opt for where you will receive a 100% Match on initial deposits of up to $/€/£125. This means you could receive up to $/€/£125 free added to your casino credits. Following your first deposit you will then receive 50 Free Spins on the online slot game, Riviera Riches. There is also a 50 % High Roller Match Bonus offer which awards $500 if you make a deposit of $1,000. As customers of Golden Riviera Casino, you are eligible to join the Vegas Partner Lounge’s loyalty program. With four tiers and plenty of exclusive bonuses and promotions available to you, it is worthwhile to be a loyalty member. If you have any queries when playing at Golden Riviera Casino you can contact their Contact Centre which is available 24 hours a day, seven days a week. They can be contacted via email, toll free telephone or the instant online chat service. Players can make deposits into their Golden Riviera Casino account via VISA, Master Card, Maestro, Solo, Switch, ClickandBuy, Click2Pay, GiroPay, Ukash, Paysafe Card, WebMoney, Moneybookers, NETeller, UseMyWallet, UseMyBank, iDEAL, POLi, EntroPay, Eco Card, InstaDebit, wire transfer, bank transfer and more. You can make deposits in US dollars, UK pounds, euro, Canadian dollars, Australian dollars and Yen. The casino employs 128-bit data encryption technology to ensure the security of your financial information.